In 1971, a little psychedelic band known as the Pink Floyd did something rather strange. They traveled to Italy, set up all their equipment in a major amphitheater, and played an entire hour-long, five-song set for no one—no one alive that is. The stage was an ancient Roman amphitheater and the location was the half-buried city of Pompeii. It would be fitting that Pink Floyd would embark upon their exploration of man at a site where society was literally pulled from the ashes. 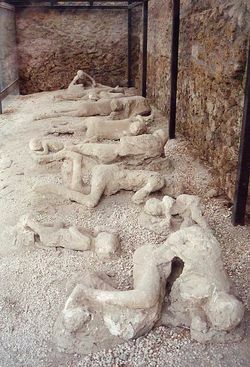 In 79 A.D. the Roman city of Pompeii was buried under a mountain of ash after the eruption of Mount Vesuvius. The town’s inhabitants died instantly in a flash of temperatures exceeding 482° F, encasing them in situ and burying them under 25 meters of soot and ash. Just like that, an entire city was nearly forgotten for over 1600 years until its rediscovery in 1748. Pink Floyd: Live in Pompeii is a remarkable piece of cinematography combining footage of city’s architecture and inhabitants and nearby volcanic activity with serene and slow camera movements around the band. The film is inter-cut with random interviews and footage of band members eating lunch at a diner and recording The Dark Side of the Moon (which was actually re-shot for the purposes of the film since those recording sessions had already happened). The set list is bookended by Echoes, a 23:30″ masterpiece broken into two parts. Additional tracks include Careful with That Axe, Eugene (shown above), A Saucerful of Secrets, One of These Days, Set the Controls for the Heart of the Sun, and Mademoiselle Nobs (vocals provided by a Russian Wolfhound named Nobs). Directed by Adrian Maben, this concert is a must see for any Pink Floyd fan or any fan of art, music, or history. Bonus: Below is the music video for the Beastie Boys’ Gratitude which was shot in homage to Live at Pompeii. Notice the speaker cases read “Pink Floyd London” about thirty seconds in.